Predators that want to get at your flock are brilliant at finding a way in the coop—so you need to be smart about your chicken fencing. When it comes to protecting chickens—or protecting something from chickens—nothing does the job like proper fencing. What kind of fencing you need will depend on how you have arranged your birds’ housing and what kind of coop you use, as well as other factors, such as geographical location and what type of predators lurk in your neck of the woods. Let’s look at fencing from both sides of the fence—pardon the pun. If you’re purchasing fencing with the intention of keeping out predators, it doesn’t have to be beautiful. But it does have to be made of solid material and securely installed, which usually means you’ll have to spend a little money and either do a little work or hire someone to do it for you. Fence pricing varies … a lot. To get a feel for how much it can cost, check out “Estimated Costs for Livestock Fencing” by Iowa State University Extension and Outreach. For our purposes, we’ll use generalities in discussing cost, such as inexpensive and expensive, and focus on durability and effectiveness of the various fencing types. Without a doubt, hardware cloth is the Lamborghini of poultry fencing, and its price tag reflects as much. Because it is a costly material, hardware cloth is best applied in and around the coop, and any coop windows should have a layer of 1/2-inch hardware cloth mesh lining the pane. Use hardware cloth to secure gaps bigger than 1 inch in diameter throughout the coop. At night, your chickens should sleep behind hardware cloth no matter where they roam throughout the day. In truth, hardware cloth is not actually fencing. Some chicken keepers—including yours truly—prefer to use hardware cloth as the mesh on outdoor runs, creating a predator-proof outdoor space. The entire run is as secure as a locked coop, and the chickens don’t require locking up each night. But when the birds get free-range time to pasture outside of the run, one of the following forms of fencing is recommended. Electric fencing comes in all sorts of shapes and sizes—and budgets. The best kind of fencing in this category for poultry is electric net fencing, a portable, electrifiable prefabricated fence. It’s rather affordable and easy to setup, move and store. This type of fencing is ideal to keep out predators, such as foxes and coyotes, though it will not deter diurnal mustelids, aka weasels, which are small enough to fit through the fence gaps. Electric net fencing has a few shortcomings: It’s not entirely low-maintenance. To keep the electricity from shorting out, it’s necessary to weed around the perimeter of the fencing on both sides. The net also needs to be properly secured to keep from forming gaps or sagging parts of the fence which larger predators could easily jump over. This fencing is ideal for homesteaders or urban farmers who want to rotate free-range areas or fertilize new garden plots. Of course, any electric fencing relies on electricity, so it’s susceptible to power outages and other related snafus. It’s best to investigate solar-powered fencing options to keep electric bills down and have a reliable source of power. Electric fencing may not be as aesthetically pleasing as some other options, but it’s very effective. While not necessarily made for chickens, a properly erected chain-link fence can serve your flock well. Especially in suburban areas or close neighborhoods, a chain-link fence between your flock and the rest of the world will protect your birds from marauding neighborhood dogs and cats while also keeping your neighbor’s prized flower beds and immaculately mulched gardens safe from your bird’s ever-scratching feet. Because chain-link is also costly, it’s best used in a dual-purpose way, so to speak, doubling as both your yard’s barrier and your chicken’s. Wood is a great natural source of fencing and may look very beautiful in a garden. However, the type of wood fencing will determine its usefulness. Tall privacy fencing will provide protection from dogs, raccoons, foxes and many other predators, provided there are no gaps in the boards or holes large enough to squeeze through. One drawback to wood fencing is that it often requires professional installation, increasing the cost significantly. Because it’s at least partially decorative, it requires maintenance, including staining and pressure washing over time, and once installed, it’s not easy to move. Lower wood fencing, such as picket fences, may be too low to even keep chickens contained. With flat tops, wood fences invite birds to fly up to perch on the top and certainly gain access to what is on the other side. While a variety of wood fencing would work nicely to keep chickens in and predators out, it’s likely best put to use if it is already part of your backyard landscape. Keeping chickens corralled is a lot simpler—and less expensive!—than keeping out predators. You’ll likely purchase and install fencing under this category if your birds already have a securely built coop and are locked up each evening. You’ll notice that a lot of the fencing listed in this section is rather flimsy and may become brittle, wear down, rust or rot over time and with use. The price tag for most of these options reflects the material’s longevity. Some of these materials are also low and create a very small barrier between chickens and outside world. Unless startled or chased, most chickens will respect even the most modest boundary created by hog fencing, cheap garden fencing, or chicken wire. Although the mesh is too thin for all-purpose predator protection, chicken-wire fencing is one of the best options for keeping your chickens out of unwanted areas. It’s inexpensive, easy to find and easy to install. It also serves multiple purposes around the homestead from making hoops over garden beds to keep out critters, to creating a barrier over brooders full of chicks. 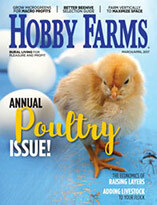 The farm-supply stores that sell chicken wire will also sell metal posts for bracing wire that don’t require hardware or the use of tools: You simply hang the mesh onto the small hooks of the metal post and hammer it into the soil with a rubber mallet. 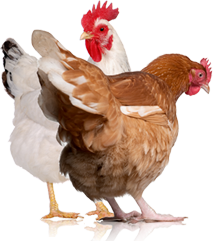 Chicken wire is available in a variety of lengths and widths, but I’d recommend a minimum of 4 feet in width to keep chickens in. It’s also easy to move using the metal post system and looks clean and rustic in a yard or garden. Another attractive, simple and inexpensive fencing option is hog fencing. With its large, square openings about 4 inches in diameter, small predators—such as weasels, snakes, mice and rats—as well as tiny chicks and very young birds may walk through freely, but it’s suitable for keeping adult chickens confined to an area, especially during the day while pasturing. Hog-fencing panels are more expensive than either plastic or chicken wire and not very easy to move once installed, but they work great and make great garden fencing for semipermanent areas. It’s easy to use the metal posts mentioned above to secure hog fencing, but it also looks nice using natural wood posts. Decorative landscape fencing is usually available at home and garden stores and is manufactured in a dizzying array of styles, colors, height, designs and patterns. It’s commonly made from new or recycled plastic, metal, and sometimes plywood or composite. While inexpensive and pretty—that’s what it’s made for, after all!—decorative garden fencing is usually rather ineffective. Many styles are too low, and chickens will simply hop over them. Others are tall but have wide openings through which a chicken can easily squeeze. Decorative fencing may work to deter new chickens for a little while, but they’ll eventually become curious and determined to investigate what lies on the other side. Decorative fencing is best used in conjunction with another type of fencing. When it comes to keeping chickens safe, form over function is the name of the game. With that said, decorative fencing can enhance the aesthetics of an urban or suburban coop nicely, and indeed, a visually appealing coop is often a requirement for those keeping chickens within city limits. 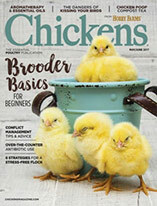 This article originally ran in in the September/October 2016 issue of Chickens.